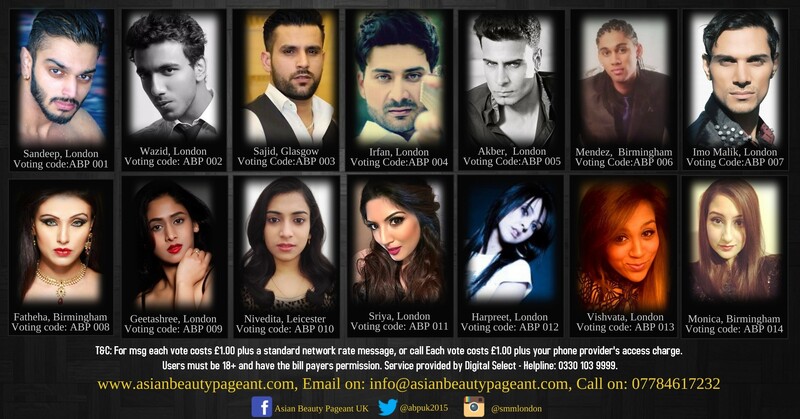 Star Media and Marketing Ltd brings you the Asian Beauty Pageant UK- one of the largest, impartial and most influential beauty pageants in the UK. Since its inception, the team has been dedicated to promoting Asian cultural heritage, international cultural awareness and community pride. The event will provide a platform where outstanding young individuals male and female will have the opportunity to display their artistic skills, intelligence, confidence, cultural pride and leadership in order to further advance themselves in society, as well as raising the profile and working alongside the official charity Football for Peace. The Asian Beauty Pageant sets itself apart from others through an evening of glamour and entertainment hosted by BBC radio presenters Sunny and Shay, entertainment by Rameet, Sheeba Khan and N S Chauhan, celebrity judges Mandy Takhar, Jasmin Walia, Maria Gardner, Reda Johnson, Kashif Saddiqi and Abhay Kumar of Bombay Guests will see an amazing catwalk with the final regional contestants showcasing their talent; bringing out each finalists individual personality whilst modelling breath- taking designs by some of the world’s innovative designers. The winners of the Asian Beauty Pageant will be announced tomorrow Friday 13th May 2016 at THE VENUE 100 ICKNIELD PORT ROAD BIRMINGHAM ENGLAND B16 0AA at 5.30pm.